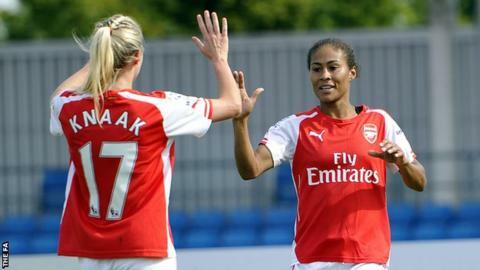 England midfielder Rachel Yankey has signed a new contract with Arsenal Ladies. The 36-year-old, capped 129 times by England, has won eight league titles, nine FA Cups and one Uefa Women's Cup since her Gunners debut at the age of 16. She made nine league appearances as Arsenal finished third in Women's Super League One last season. The length of her contract has not been announced by the club. Yankey was not included in Mark Sampson's squad for the SheBelieves Cup in the United States.